Curl up with a cozy afghan on a cool summer night. 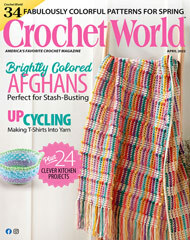 Use this free crochet pattern to stitch a pretty, peachy afghan. It's easy enough for a confident beginner! This would make a great wedding gift or a housewarming present!